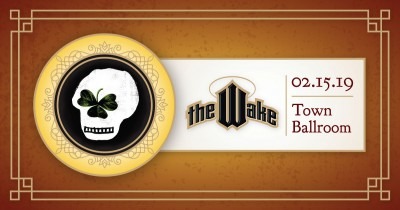 The Wake... A Party to Die For! The Party to Die For! Beer, wine, food and shenanigans will abound as ICTC returns to the Town Ballroom for a rollicking Wake, Irish-style. Your $50 ticket price includes all the beer, wine and food you can handle plus continuous entertainment. Dance the night away to the music of The Dady Brothers and our headliner, Crickwater, as they play a mix of rowdy pub songs and fiery fiddle tunes sure to bring down the house. Mix and mingle with the family and friends of our fictitious "dearly departed" as we bid him (or her!) a fond and final farewell, complete with bagpipes and Irish dancers. No need to wait until St. Paddy's Day to get your Irish on! Join us at The Wake. Special thanks to Guinness and Labatt. Proceeds benefit the Irish Classical Theatre Company. The Wake is Irish Classical Theatre Company's annual fundraiser.